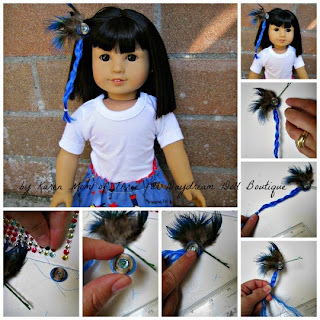 Today I am so excited to share with you two easy and inexpensive ways to create hair extensions for your dolls using items you can find at your dollar and craft store. Step 1- Assemble your supplies, plug in your glue gun to heat it up. Cut 16 inches from your rope. Step 3- Open a bobby pin between your fingers. 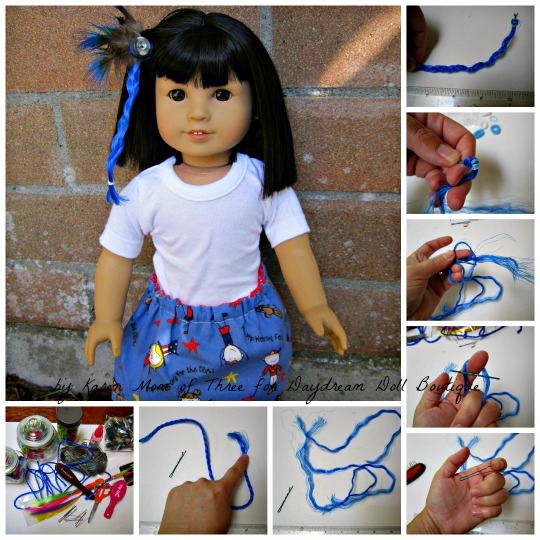 Take one of the strands of rope and fold it in half, put the middle through your bobby pin so that a loop appears .Bring the ends through that loop and pull tight. Secure the rope in place with a elastic. This is now your hair extension. Step 4- Braid your “hair extension” and secure the ends with the other hair elastic. Trim the ends so they are all even. 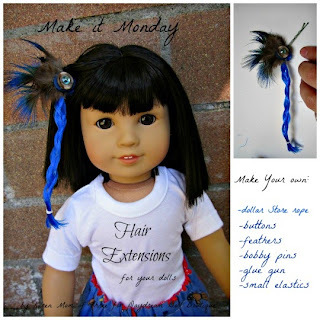 Your hair extension is ready to wear! To dress up your hair extension as I have done follow the steps bellow. 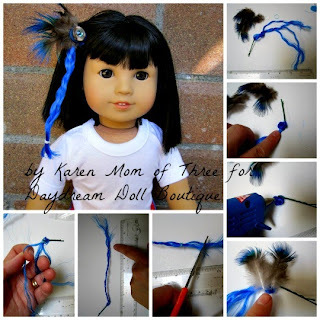 Step 1- For this embellished hair extension repeat the 1-3 steps in the above tutorial but use twice as much of the separated rope. Step 2- Once you have secured the rope on the bobby pin with the elastic, add a dab of glue and carefully press some feathers into place in the hot glue, repeat until you have used the desired amount of feathers. Step 3- Glue two buttons to each other and then glue a gem sticker in the center of the smaller button. 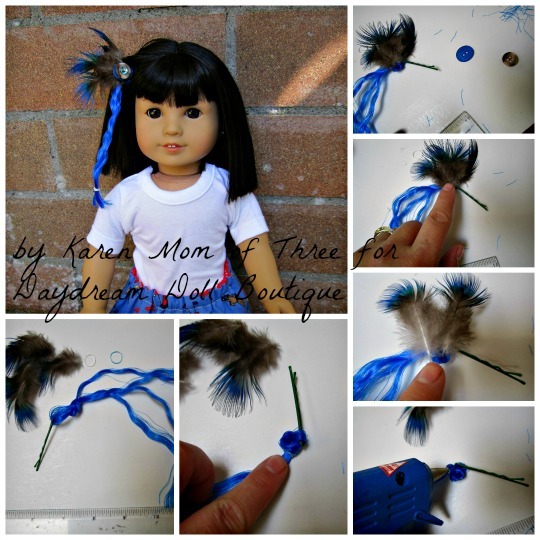 Step 4- Glue the buttons to the feather, press into place to secure. Step 5-Braid your “hair extension” and secure the end with another elastic. Trim the excess at the end. 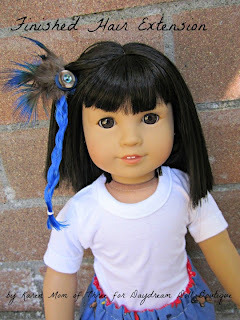 Step 6- Place your hair extension in your dolls hair.